Shop Local – Michigan’s Best! Supporting our state, our farmers, our neighbors and our families! Top 5 Reasons to Buy Local! 1. Keep money in our economy. If each family started spending $10 per week of their grocery bill on Michigan products, we’d keep more than $37 million in Michigan each week. (Source: MI Department of Agriculture. 2. Local food is better for you. The shorter the time between the farm and your table, the less likely it is that nutrients will be lost from fresh food. 4. Local food keeps taxes down. According to several studies by the American Farmland Trust, farms contribute more in taxes than they require in services. 5. Local food is an investment in the future. By supporting local farmers today, you are helping to ensure that there will be farms in your community tomorrow. Improving Michigan’s economy sounds like a pretty big task, but there are plenty of little things that we can do to make an impact! Make changes in your buying habits starting today. 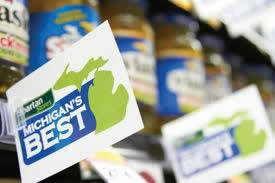 Buy Michigan’s Best. Read labels before you make a purchase and ask yourself if there is a Michigan-made alternative. Write the editor of your local newspaper and urge them to support Michigan’s Best. Visit a different gallery, museum, park, or zoo each month to promote Michigan tourism. Invited to a party? Take your host or hostess a Michigan thank-you gift. Suggest that your favorite restaurants carry more Michigan-made food, wine, and beer.